The might of Chloe Alper and Mat Collis’ Tiny Giant kicked off our proceedings in considerably dominant fashion. Performing with an expanded live outfit, these harmonic generators wowed the impressively numbered early crowd at the Oakford Social Club. Sharing a similar quiet/loud dynamic to the likes of The Joy Formidable, tracks like the brilliant 'School Of Hard Knocks' proved appropriately popular. China Bears followed, replacing Drug Store Romeos, hamstrung by technical issues during an elongated soundcheck. The band did thank the audience for their patience, rewarding us with emotive offerings bearing some reminiscence to Bear's Den and Amber Run. A new track bearing more urgency suggests a promising new front may be on the horizon. Our next stop was one of Are You Listening’s local acts Saltwater Sun at Sub89, whose melodic indie rock reminded us of the now departed Let's Buy Happiness. This was however more solid than spectacular, albeit not for lack of effort. Aden Pearce’s Nightjjar unfortunately suffered in the claustrophobic atmosphere of Milk, where festivalgoers quite happily chatted loudly mere feet away from the stage. (Please don't do this.) His ambitious, melodramatic sounds deserved better. Valeras had no such problems back at Sub89, with their visually impressive hair flailing accompanying a bombastic sound, at times not too dissimilar from Wolf Alice. Mixing in elements such as grunge and psych, they also importantly filled the festival's cowbell quotient. Following this terrifically well-received set, a future festival headline slot could well await. While Febueder sadly lacked impact at the resplendent St Laurence Church, Ever Hazel at South Street Theatre proved quite the opposite. Led by Hazel Tratt, who also moonlights in Lyla Foy's live band, the ethereal trio delighted with their Kate Bush-inspired efforts and unusual headwear, as showcased in the video to 2017's 'A Surgeon's Hand'. It's not unusual to be (loved by anyone) pleasantly surprised by an act at a music festival, and such an honour in this instance was bestowed on the endearing Ray Wills. The sparse but receptive crowd at South Steet Studio were wowed by Wills' powerful vocals, intricate guitar playing, and perhaps above all, his earnestness - "if you don't like my songs, you can tell me, I'll take it on the chin and practice harder." On this evidence, he's doing just fine. Walking into the Purple Turtle, we were greeted by a cacophonous singalong to seminal Fountains Of Wayne classic 'Stacy’s Mom' in what is possibly one of my favourite festival moments of all time. Certainly, one of the most joyous. The quite unexpected return of The Longcut this year has been similarly pleasing, and their set mixing new and old proved that they can still deliver. "The new album took us nine years, we'll try to be quicker next time!" We certainly hope so. Back at the South Street Studio, we encountered the charm and wit of Emma Winston (performing as Deerful) in full flow. Her blend of indie-pop and electronica was as entrancing as her amusingly awkward interactions with various members of the audience. This juxtaposition was best encapsulated in 'Two Thousand One Hundred And Sixty' (unexpectedly echoing Bloc Party's 'The Pioneers') which inspired a small breakaway dance duo, fuelled by the nostalgia of Game Boy-led instrumentation and two quite full glasses of wine. Tempting as it was to try to stick around for the enigmatic festival headliners Field Music, we instead went back to London more than satisfied with our day’s work. With such a fantastic track record already and 2019 early bird tickets sold out in record time, Are You Listening? looks set for another great year of success already. 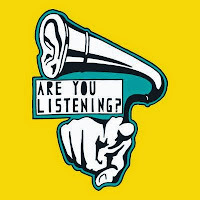 Find more info about Are You Listening? Festival at areyoulistening.org.uk, where you can also purchase summer rate tickets for the 2019 Festival.